Inkpop is hosting yet another amazing Weekly Writing Contest, and this one is based on the debut novel Divergent by Veronica Roth. "Honest, Brave, Selfless, Peaceful or True, those are the only type of people you can be in the world of DIVERGENT and you can only be ONE! So what happens when a character, like Beatrice Prior, finds themselves embodying more than one of these persona? Who are you when you are not what society expects you to be? That is the challenge! Write a short story or poem that explores a character that does not quite fit into the world around them. Like Divergent you can create a dystopian environment where everyone is supposed to act a certain way or you can explore a world much closer to your own, like a high school where someone just doesn't quite fit in." Two writers will be selected by Veronica Roth and will win not only a copy of Divergent, but also three (that's right, THREE) other books of their choice from the HarperTeen catalog. Not a writer? That's okay because two commenters will be chosen at random and will also win a copy of Divergent, as well as three other HarperTeen books of their choice. For more information about the writing contest and how to enter, please check out inkpop. Good luck, everyone! That sounds really cool! 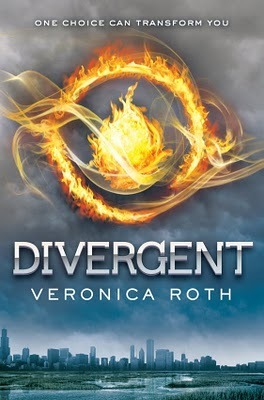 I loved Divergent, and I've never hated any of the HarperTeen books I've read before!